I so enjoyed the relaxing time I had painting this image from Art Neko called Iris-Orchid Artist Trading Card. I first stamped the image using Memento London Fog as I liked the lighter shade and the London Fog has a hint of green in it. As I was using watercolours I heat set my stamped image before proceeding. To paint I used my Zig Brushes and aqua brush. 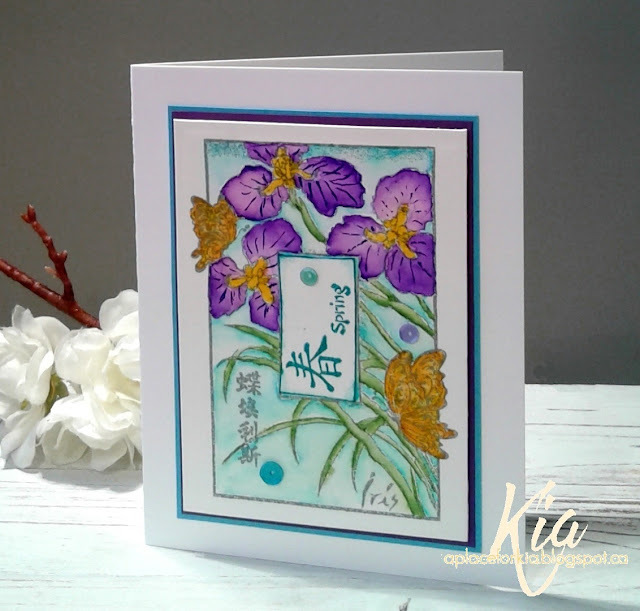 In the centre of the image I painted using a darker colour, then cut another piece of paper slightly smaller and attached, giving a nice border for my sentiment piece, which I stamped using the 4 Seasons Kanji and English Spring sentiment. I applied foam strips to the back of my image, then attached to the matting, which is in the purple and aqua. And ~ a few sequins to finish. Products: Art Neko Iris-Orchid Artist Trading and 4 Season Kanji and English Stamps, Zig Clean Brushes, Aqua Brush, Neenah Cardstock, Paper Garden Cardstock, Fabriano 140lb Hot Press Watercolour Paper, Sequins, Foam Tape.